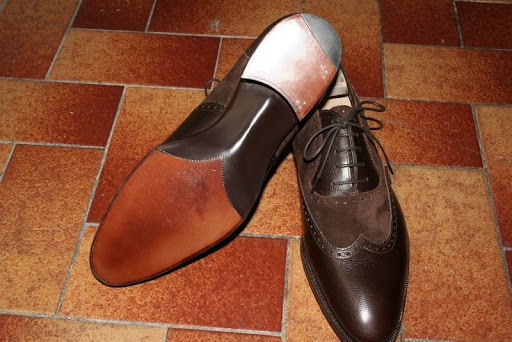 In the bespoke shoe world, many small details are added to the shoe to set it apart from an any ordinary ready-to-wear pair. 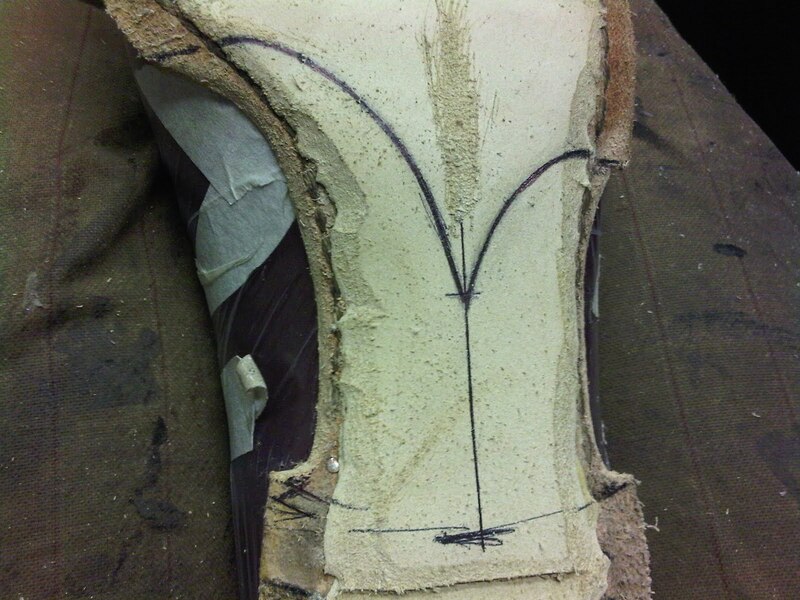 One of these details is called a ‘fiddleback waist’ or ‘violina,’ in Italian. This particular detail happens to be my favorite as well as my least favorite. 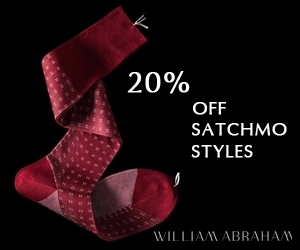 As a customer I love the symmetry of it and how it plays to the shoe’s shape and curves by accentuating their features. As a shoemaker, it is the hardest detail to add to the shoe. 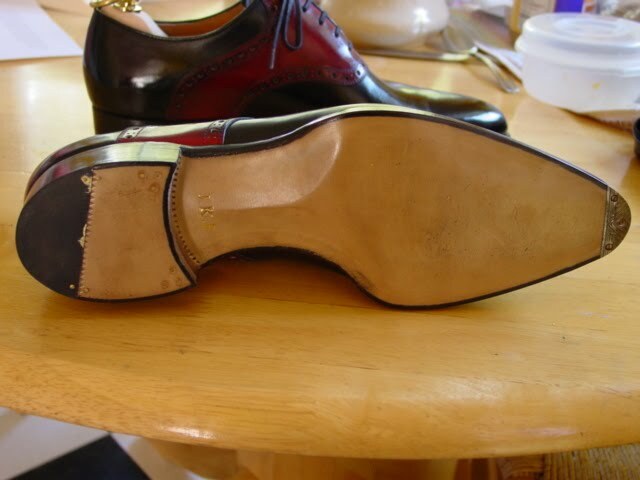 It is time consuming, has to be precise in its shape and needs to match perfectly on each shoe so that one does not differ from the other. This is not easy to do, but when done well it is very much worth the effect that the detail provides for both the customer and the maker. 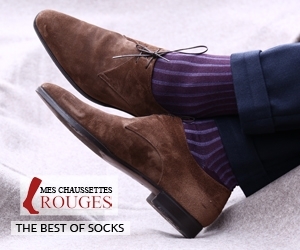 It is a sign of pride in your craftsmanship and a sign of elegance in your shoe. There are many steps to this process of which I had some pictures to a few of them. This stage above is the very beginning of it, creating the v-shape within mid-sole to produce the effect on the outer sole. 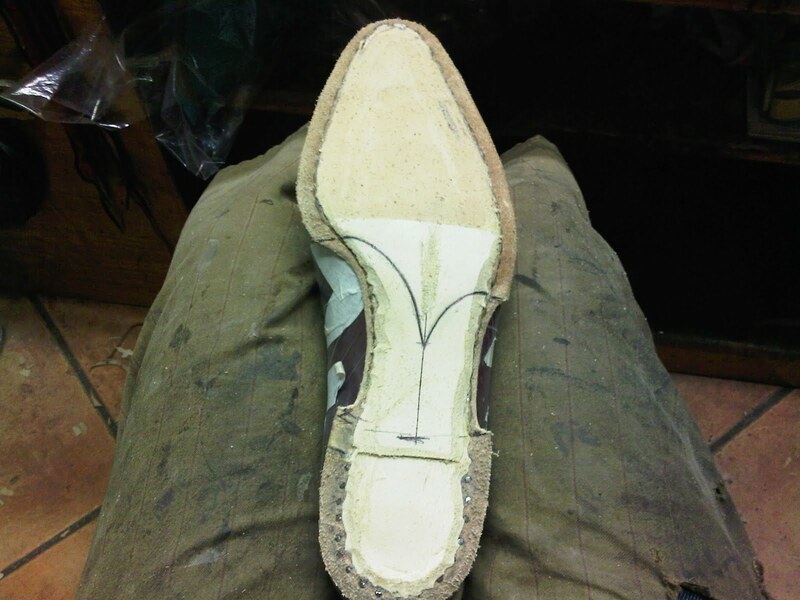 As I said before and which you might be able to tell in the pictures, the precision of your drawing on each shoe is immensely important or you will create a pair of shoes with obvious differences between them. You will see in the pictures below that instead of creating a v-shape with a sharp middle point serving as the high point to the waist, I created more of a hump in the middle of the waist. Considering that I used the v-shape on all of the shoes I made before these, I wanted to do something differently for this pair. Here you will see the finishing effect of the fiddleback. There are many other stages to it that I unfortunately did not have pictures to show you. 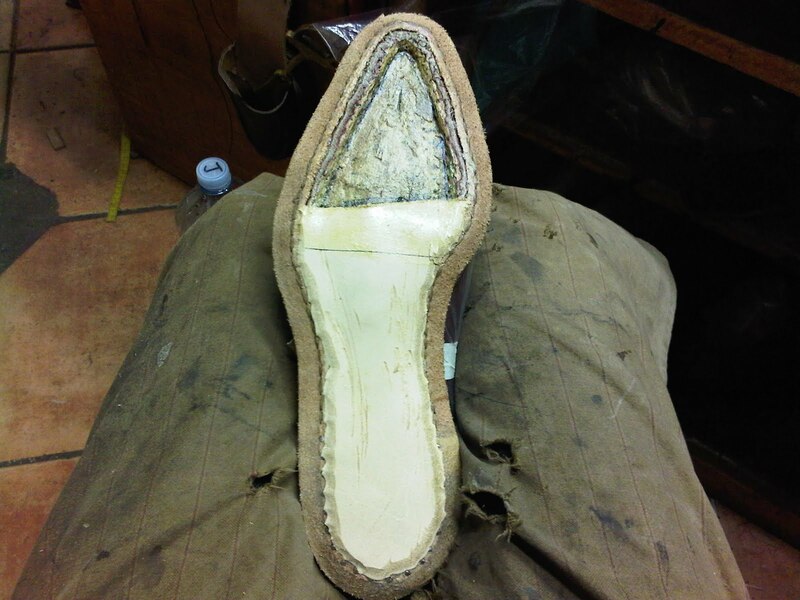 One of these is when you apply the sole onto the shoe and have to use a piece of glass to thin out the sole’s leather to create the beveled waist. 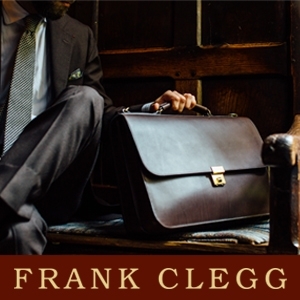 This detail was once something that only bespoke shoes offered but as machinery and technology get better I believe that this will find itself spreading more and more into the ready-to-wear industry. Some makers who currently use this feature on their RTW shoes are Gaziano & Girling and John Lobb. Above are some pictures of my other shoes. On my latest shoe, pictured on the left, I did not apply the v-shape and while I don’t regret not doing it, I realized that I much more appreciate the looks of the v-shape on one’s sole. 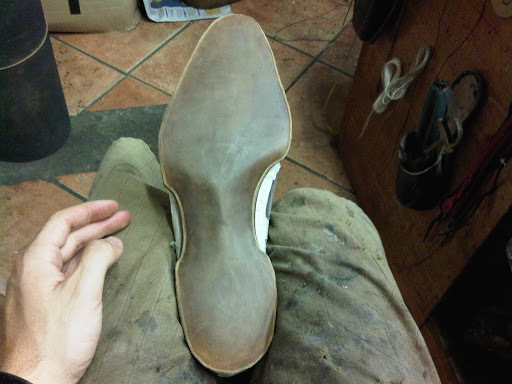 I have read that one of the ways to figure if a shoe is bespoke or MTM is to gently rock it side to side if it balances. Does the beveled waist play a part in this theory? 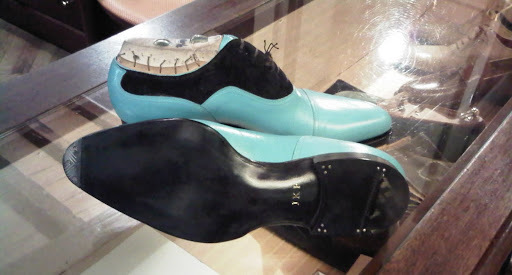 These are very stylist shoes.These shoes are some of the most reliable and robust shoes available on the market today. Though it is on the sole and unseen to those who look down at the shoe . 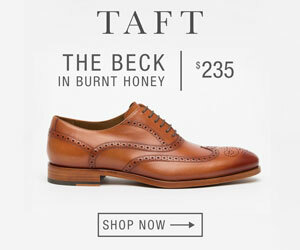 . . to the person wearing them it is the small details like that that make a pair of shoes exquisite.